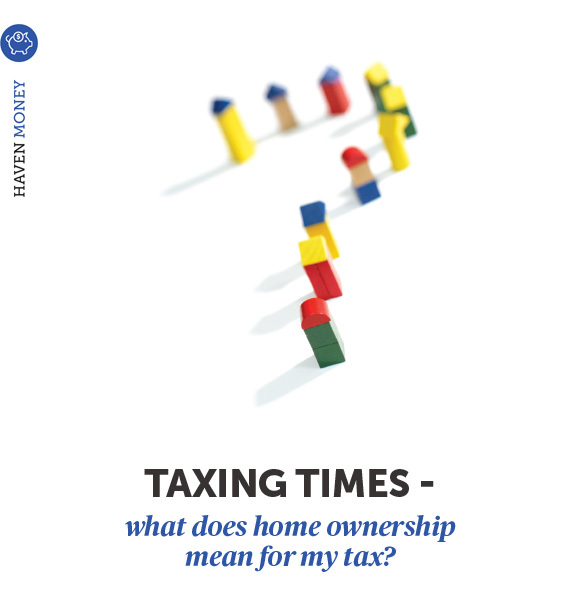 Taxing Times – what does home ownership mean form my tax? With much debate in this election year about whether to scrap negative gearing to boost the federal budget, we thought it timely to look at the tax implications of property ownership in Australia. Politicians have been divided for decades over whether negative gearing should be abolished. Negative gearing is when you borrow for an investment and the costs associated with that investment exceed the income. Any losses can then be claimed against your income tax. Those against the policy claim it is inflating the property market and pricing out owner-occupiers, especially first time buyers, while giving a leg-up to the rich. They argue negative gearing is subsidising investors, who can claim a loss on an investment property year after year and cash in on increased property values when they eventually sell, or dip into equity for other investments. Advocates for negative gearing insist the tax provision makes property investment accessible to average income earners and helps ensure an adequate rental market. Debate resurfaced in the lead-up to the federal election with calls for negative gearing to only apply to new properties as one measure to start plugging the nation’s budget. For now, negative gearing remains available to the 1.9 million Australians who own one or more rental properties1. Another tax provision that remains attractive for property investors is the concession on capital gains tax. Your capital gain equals the difference between what you pay and what you sell an investment property for, minus any costs associated with the purchase or sale such as conveyancing, agent’s fees, loan set-up charges and stamp duty. If you bought an investment property after 1999 and have owned it for more than a year, you can claim a 50 per cent concession on the capital gain before your marginal tax rate is applied. Let’s say you sell an investment property you have owned for five years and end up with a capital gain of $150,000. If your income tax rate is 37 per cent, you would pay $27,750 CGT, with your total capital gain halved to $75,000 before your tax rate is applied. If in the top income tax bracket of 45 per cent, your CGT in the same scenario would be $33,750. The CGT discount applies to individuals, including partners in partnerships and trusts. A 33.3 per cent CGT discount applies (instead of 50 per cent) if you invest through a personal super fund. Although most of the talk about tax and property relates to investors, there are actually considerable tax benefits for owner-occupiers. It’s not tax deductible but the home in which you live is still something of a tax haven because you can make as much profit as you like on its sale and not pay any tax on the capital gain. If you own your home for many years and pay down your mortgage in that period, chances are when it comes time to downsize or relocate, you can reap significant tax-free profits on any increased property price. But what if you don’t live in your home the entire time you own it? The good news is the tax-free benefit still applies, providing it remains your primary place of residence and you are not gone for longer than six years at a time. You could, for example, take a job or travel overseas for a few years, rent your home out, and still, when you sell it, not pay a cent of capital gains tax on your profit. Just be aware you have to claim any rent as income, so there are still tax considerations. Home ownership is also no hindrance when it comes time to apply for the age pension. Even if your principal residence is worth millions, providing your land does not exceed two hectares it does not form part of the assets test for pension eligibility. While investment property, cash deposits, shares, business equipment and even contributions to retirement villages can all impact your pension test, your castle is protected. You may be able to minimise your tax burden by investing in property via trusts, such as family discretionary and unit trusts, depending on how many units you hold, your income and your other assets. Your accountant, tax agent or financial planner is best placed to make recommendations based on your individual circumstances. Even without federal elections, tax rules change regularly. If you are buying or selling property, transitioning to retirement or aged care or helping parents navigate that phase of life, speak to a taxation expert to ensure you get the latest and most accurate information and understand the implications for your situation. Check the ATO website for the latest rules on how property ownership can affect your tax. The website has detailed but easy to follow information on topics such as capital gains tax and how property assets affect aged pension eligibility, along with examples. Tax: the information in this article does not constitute advice. As taxation legislation is complex we recommend you speak with your financial advisor, tax advisor or contact the ATO for further details and expert advice regarding your personal circumstances. Specialising in all forms of residential loans and various funding options. We can assist you with numerous cashflow based business facilities. Offering a wide range of competitive Commercial Property Finance Options to suit your needs. Finance solutions for vehicles, trucks, technology and equipment. 20 years of expertise with regular involvement in the SMSF lending area. Providing expertise and variety to developers in search of construction financing Australia wide. Copyright 2014. Hedge Finance Group.